The French capitalist elite that sponsored Macron’s meteoric rise is acutely aware that the European Union is in serious trouble. They chose Emmanuel Macron to save it. His success or failure depends on whether he can persuade the rest of the EU, notably Germany, to let it be saved. The EU is in serious trouble politically, because the elites love it, and ordinary people do not. A poll published June 20 by the Chatham House Royal Institute of international affairs found a “simmering discontent” with the EU among ordinary Europeans. Over 70% of people classified as decision-makers and opinion influencers – leading politicians, journalists, CEOs and leaders of major civil society organizations such as university presidents– welcomed European integration as beneficial, whereas only 34% of ordinary citizens agreed. On immigration, 57% of the elite consider immigration good for their country compared to 34% of the rest of the population. In short, the “decision-makers and opinion influencers” agree with the decisions they have been making and the opinions they have been advocating, while most other people are not convinced. This is scarcely surprising since for over half a century the elites “who know what is best for the people” have been forcing European integration down their throats, with massive propaganda to justify major binding decisions taken without consulting the people (or, when the people are consulted, the result is ignored). Member States’ democratic procedures were essentially nullified over half a century ago by the unelected European Court of Justice when it ruled that European laws prevailed over national laws. The vast majority of Europeans were not even aware of how their democracy was being overruled and made obsolete. “Europe” meant escape from the bad past and the promise of a beautiful future of peace and prosperity. The elites saw to it that the real existing “Europe” is based on two principles: “free movement” of everything and absolute respect for “competition”. Presented as the apex of European values, these principles are neither moral nor democratic. They simply give all power to international financial capital. The elites have long been able to live comfortably with popular discontent. But economic troubles threaten to wreck the whole setup. Throwing together countries with deeply rooted differences in social philosophy and practice, binding them together with a common currency and rules that prohibit adaptation, does not work. As the spearhead of globalization, Europe’s dogmatic enforcement of both competition and “free movement” of goods and capital is enabling foreign capital – Chinese, Qatari, U.S., etc. – to buy up much of its productive resources piece by piece. Instead of growth, the euro has brought stagnation. The reign of unlimited “competition” promotes beggar-thy-neighbor practices rather than solidarity. Germany has lowered its labor costs, and continues to maintain large export surpluses with its neighbors, whose own budgets are broken by the trade imbalance. Concentration of wealth and lowered income decreases consumption and causes businesses to failure and tax revenues to shrink. The European Union finds itself on the edge of a perilous downward spiral. France’s position in the troubled European Union was the overriding issue in recent French presidential elections. The issue was obscured by trivialities, such as media-inflated “scandals” over politicians hiring their wives and children, or non-issues such as “the fascist threat”. Yet the issue was there. Among leading candidates, both Jean-Luc Mélenchon and Marine Le Pen flirted with the notion of leaving the euro, or even the EU itself, but neither had a clear handle on the issue. In her decisive final debate with Macron, Marine Le Pen proved incapable of clarifying her own position on the euro. In the absence of any clear alternative to EU membership, voters were more frightened than seduced by the notion of getting out. Seeing no clear choice, voters massively abstained. 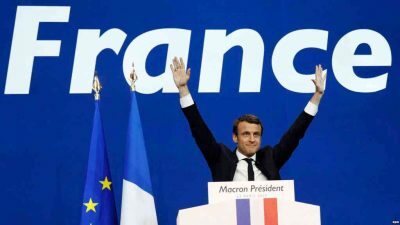 As a result, the European Union won the French election, in the person of Emmanuel Macron. Macron’s mission is to bring the alienated couple, the EU and the French people, together – by persuading both to do what they don’t want to do. Macron’s June 21 interview with the French daily Figaro and seven other major European newspapers clarified his salvage strategy. The key word is “protection”. The idea is that people can develop loyalty toward institutions that protect them, and people do not feel protected by the EU. This interview included significant foreign policy statements, notably a change in France’s policy toward Syria. Macron announced that “imported neoconservatism” is no longer welcome in France. In all our EU societies, “the middle classes have begun to doubt”, Macron observed. “They have the impression that Europe is being built in spite of themselves. This Europe is dragging itself down.” Thus Europe must be made to provide both physical and economic security in order to reassure the citizens and regain their support.The physical protection involves controlling migration and cooperating in eradicating terrorism. The political impact of recent terrorist attacks ensured that any new French government would have to take moves to secure borders and control immigration, but Macron chooses to try to accomplish this at the European level. So far, disagreements between Member States have prevented effective measures from being taken. This implies that there must be limits to demolishing French social benefits in order to satisfy German demands for lower labor costs and a balanced budget. Meeting those demands is seen as the necessary condition for gaining German confidence in order to shift from austerity to prosperity programs. But it requires a quid pro quo. “The strength of some cannot feed for long on the weakness of the others.” In other words, German political leaders need to accept the fact that an EU which benefits Germany at the expense of other member States cannot last forever. Macron’s statements on foreign policy could be seen as hints of a possible joint European foreign policy, partially independent of the United States, at a time when Washington appears to be paralyzed by deep state efforts to overthrow the President. The result was failed states where terrorist groups prosper. Somewhat ambiguously, Macron professed to be “aligned with the United States” on setting a “red line” against use of chemical weapons in Syria. Yet this statement is not precisely aligned with U.S. practice, which has always automatically blamed Assad for chemical weapons attacks, without ever bothering to “trace where they came from” or to limit retaliation to the arms stocks themselves. As for Russia, Macron was also ambiguous, stressing unspecified “disagreements” with Vladimir Putin over Ukraine, while distancing himself from current anti-Putin hysteria in Washington by observing that Putin’s objective is to ensure the survival of his country, not to weaken the West. Any one of the other leading candidates for the French presidency would almost certainly have gone farther toward rapprochement with Russia. While neoconservative influence has permeated French media and the Socialist Party, it does not control the French establishment as in the United States. Macron’s statements are a long overdue recognition of reality in harmony with informed opinion in France, notably in the diplomatic, military and business communities, which see the U.S.-induced Russian bashing as unjustified, contrary to French interests, and dangerous. These shifts in foreign policy were probably an inevitable reaction against the past ten years of Sarkozy-Hollande’s absurd role as puppy dog running ahead of its American master, yapping at Washignton’s chosen enemy. Such concessions to reality could contribute to working out a common foreign policy with Germany, which has tended to keep its distance from certain U.S.-led military adventures. However, they are accompanied by urgent appeals to Germany to increase its military spending, at a time when the United States is making similar demands, in order to strengthen NATO against the Russian “threat”. Macron in contrast seems to have in mind the prospect of strengthening Europe by providing it with a strong military defense of its own, presumably not totally under U.S. command. The current struggle for power in Washington favors moves toward European independence. This can sound good if indeed it allows Europe to bow out of various U.S.-incited wars in the Middle East and elsewhere. But military buildups are costly and dangerous in themselves, and not the appropriate way to promote peace in Europe and beyond. The arms race that United States threats have incited in Russia and China shows signs of spreading. There are forces in Germany all too willing to seize any pretext to revive German military strength. Macron’s efforts to save the EU marriage will encounter stiff resistance from both sides – and not least from the European side. The resistance in France will be minimal in a parliament entirely under his control. The largest “opposition” party, the Republicans, are moving toward supporting him. The Socialist Party is decomposing rapidly, and the rest of the opposition is tiny and divided. Opposition in the streets sounds revolutionary, but it is not favored by the current relationship of forces, notably the weakness of the unions and the strategic disadvantages of a diminished industrial working class. The resistance to Macron’s projects in Europe stems from the mere fact that the EU includes too many nations with conflicting interests and cultures. On the issue of control of migration, for example, German Chancellor Angela Merkel has opened wide the gates to refugees, whereas Hungary is intent on keeping them out. Germans, or at least some of them, consider mass migration good for a country with a low birthrate. Hungarians, in contrast, want above all to preserve their cultural identity. The Baltic States, many of whose current leaders were nurtured in Cold War America, as well as Poland, with its bitter historic rivalry with Russia, support U.S. demands for a defensive/aggressive military posture against Russia. This has virtually no support in France, Italy or Spain. As for economic interests, they are widely contradictory, with important differences between North and South, East and West, that cannot easily be unified. And finally, except for the mobile, multilingual elite, people in Europe do not feel European: they feel French, or Italian, or whatever. Macron’s mission is clear, but it might turn out to be mission impossible. Diana Johnstone is author of the introduction to her father’s book, From MAD to Madness, by Paul H. Johnstone (Clarity Press, 2017), and author of Queen of Chaos: the Misadventures of Hillary Clinton (CounterPunch, 2016).